We offer Ayurvedic consultations in person, over the phone, or via Skype or Facetime. In these sessions, we work with you to create an empowering and effective treatment plan that usually involves herbal medicine as well as a number of other healing practices. Typically Michelle meets with patients about once a month to give the herbs time to work, to make adjustments, and to help you to overcome obstacles on your path toward balance and wellness. Laura typically meets with clients more frequently, depending upon the type of work being done (for example - nutritional coaching usually involves weekly sessions for 1-3 months, depending on client goals). We also offer more standalone individual SERVICES such as crystal healing, energy healing, and medical intuitive sesisons, flower described below; these techniques can also become part of an individual treatment plan. For patients looking to learn and take their health in their own hands a bit more, we have created a four-session four-month Sacred Self-Care healing intensive that will give you the tools you need to manage your own health in a holistic manner. Please email Michelle at MICHELLE@MICHELLEAYURVEDA.COM or text 443-253-6221 (keep it brief please) with any questions. We are excited to begin our journey with you! ​This 4-month program consists of monthly 90-minute healing sessions designed to provide a comprehensive introduction to Ayurvedic medicine and give you the balance and healing you’ve been seeking. Session One: What’s My Dosha? Session Three: What’s Going On with Me? To sign up: Click here to visit the Health Revolution online apothecary, purchase the Sacred Self-Care healing intensive program, and then email michelle@michelleayurveda.com to schedule your four sessions—so easy! PLEASE NOTE: Michelle is not taking new patients for Ayurvedic Consultation at this time. Laura is available for new patient evaluations and has appointments open on Sundays. In these sessions, we work with you over a period of time to uncover and heal the root causes of your illness(es). We conduct in-depth analyses of your physical, mental, spiritual, energetic, and emotional states, and then work with you to create a treatment plan that’s both empowering and effective—and compatible with physician-prescribed medications and therapies. ​These sessions are suitable for individuals prepared to make changes in daily routines, sleep, and eating habits. We will likely recommend herbal medicines which may be included in your consultation fee depending upon the type of appointment scheduled. Consultations are available in-person or by phone Skype, or FaceTime. Flower essence therapy is a gentle yet powerful (and lovely!) method for releasing the emotional and energetic blocks preventing you from achieving physical health and emotional balance. Flower essences capture the delicate energetic imprint of each flower—and can be used to address issues more subtle and emotional than physical when applied to marma points (acupressure points) on the body. The sessions begin with a refreshing flower essence drink, and then we’ll discuss the obstacles you’re having as Michelle apply the essences to your skin to release emotional blocks. Michelle will also use other therapies like Reiki and tapping as we work. This therapy is suitable for anyone who is ready to explore the energetic and emotional side of healing, and is not a suitable replacement for therapy or psychiatric medications (though an excellent add-on to these treatment strategies). ​These sessions are intuitive assessments and active healing of the physical, emotional, mental, and spiritual issues contributing to your present state of health. Typically, we begin with a clearing ritual, then Michelle will call in spirit guides to help. From there we may incorporate energetic healing, emotional release techniques, meditation, and breathing practices into the session. We may discuss past (and past-life) experiences and how they impact your current state of health/emotions/mental patterns. These techniques can help us find the origin of a problem that is not purely physical in nature but may be affecting the physical body. In these sessions Michelle employs a combination of Reiki, Pranic Healing, and her own intuitive energy healing techniques developed over decades of practice, to release stored emotions from the tissues of the body and bring them to the conscious level to be cognitively processed and released. ​In this way, we can clear energetic attachments and balance your chakras. 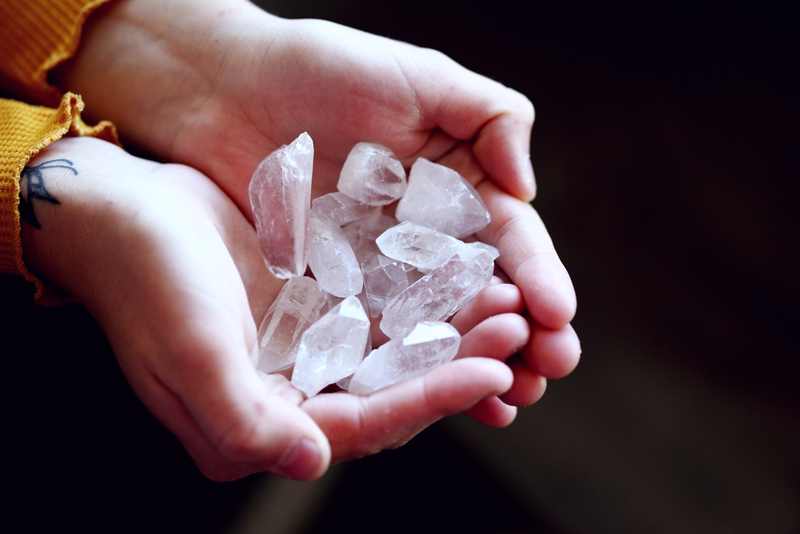 Michelle may also recommend crystals or other at-home healing tools based upon insights received during the session. Messages may come through during these sessions from spirit guides, angels, and other beneficial beings. Crystal healing sessions are available only for in-person sessions. We are no longer offering abhyanga services. Apologies for any inconvenience.